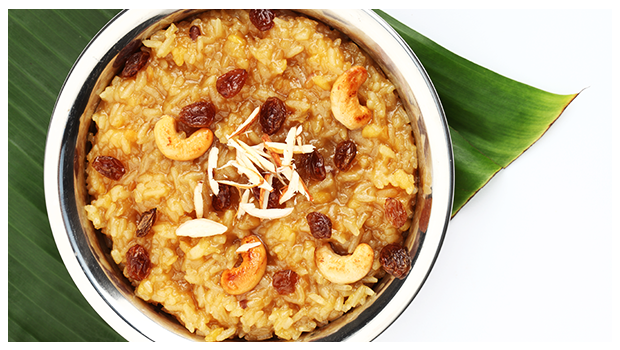 Pongal is not only a four-day-long Tamilian harvest festival but also a scrumptious rice preparation. Rice is the key ingredient of the dish as it’s one of the main harvests apart from sugarcane and turmeric. But did you know there’s more than one way of making Pongal? Chakkara/ sakkarai Pongal (Sweet rice): This preparation is used as prasad. Boil 100ml of water and melt in 250 gms of jaggery powder till you see a syrup-like consistency. Separately cook 100 gms each of rice and moong dal in 200ml water after dry roasting them till golden. When the rice is half done, add 200 ml of coconut milk and cook. Once cooked, add the jaggery syrup and 1/4th tsp cardamom powder and mix well and turn off the heat. For the garnish, stir fry 1/4th cups each of almond, raisins, and cashews in 200 gms of ghee, till golden brown. Ven/ Khara Pongal (white rice): This is the salty version of Pongal. In a pressure cooker, heat 100gms of ghee and stir fry 1 cup rice and ½ cup moong dal for 3 minutes. Add 4 cups of curry leaf infused water, salt and pressure cook it till 3 whistles. In a separate pan, stir fry 100 gms ghee, fistful cashew nuts, 1 green chili, 1 pinch hing, 1 inch chopped ginger, few curry leaves and 1 tsp each of peppercorns and cumin seeds for a minute. Pour this tadka over the cooked rice and your dish is ready. Puli Pongal (tamarind rice): Tiger (Puli) rice gets its name from its colour. In a pan, heat 2 tbsp oil and add 1 tbsp urad dal, 1 split green chili, 1 dry red chili, 1 tsp grated ginger, ¼ tsp hing, and 8 curry leaves and stir fry for a minute. Now add tamarind paste (made out of ¼ cup tamarind and ½ cup water) and cook for 2 minutes. Next, mix in 3 cups of steamed rice and salt and cook for 5 minutes. Sugarcane Pongal: In a pressure cooker, add 1 cup dry roasted moong dal, 2 cups rice, 4 cups each of sugarcane juice and water, cook till 3 whistles. Heat ½ cup ghee in a pan and stir fry ½ cup chopped dates, 4 tbsp chopped cashews, ½ tsp cardamom powder and cook for a minute. Add this to the rice and mix well. As you sow, so shall you reap. Only if you eat natural and chemical-free food can you harvest good health. To ensure this, prepare your meals only with organic food ingredients. Where to find them? 24 Mantra Organic – India’s most trusted organic food brand. Shop with us now!